FRANK LERNER, after graduating Cornell University, 1959 (B.A.) and Brooklyn Law School, 1962 (J.D. ), became a member of the New York State Bar in 1963. After completing six months active duty for the United States Army as a member of the US Army Reserve, he became a member of the New Jersey Bar in 1964. 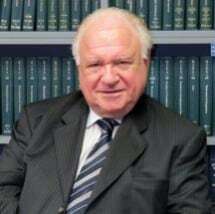 His first position with Schwartz & Horowitz, 26 Journal Square, Jersey City, New Jersey as a trial attorney for claimants in personal injury and Workers Compensation evolved into partnership in 1969. While specializing in litigation, he gained experience and expertise in general practice in an urban community. In 1971 he amicably resigned from Schwartz, Horowitz & Krivitzky and began solo practice at 26 Journal Square, Jersey City, New Jersey continuing to specialize in personal injury, medical malpractice, product liability and Workers Compensation matters all representing claimants. Over the years thereafter, Frank Lerner, P.A. has become Lerner, Piermont & Riverol, P.A. The firm of Lerner, Piermont & Riverol, P.A. needs no special introduction in Hudson County as each of the members thereof have distinguished and respectable careers. FRANK LERNER, in addition to trial experience in all courts in New Jersey and the Federal Courts in New Jersey and New York, served as a Master of the Hudson County Inns of Court of the American Inns of Court; an Arbitrator for the Superior Court, Law Division of Hudson County; a committee member of the New Jersey State Trial Attorneys, Workers Compensation Section, Hudson County; a Trustee of the American Association of Trial Attorneys (ATLA); and member of New Jersey State Bar Association and Hudson County Bar Association. He has lectured in medical malpractice and personal injury/product liability trial strategy and preparation at New York Law School. He is currently admitted in to the New Jersey and New York Bars.